For 1981, AHM lists this model as NEW however it appears to be the same as offering prior to this listing. The debut of this classic New York Central steam engine in the AHM line dates to early 1972. Railroad Model Craftsman magazine first reviews the Streamlined Hudson in its April 1972 Test Track column. The 1972 retail price is listed as being $37.98 for this impressive model. In 1977, you could have bought this NYC Streamlined Hudson for $89.98. For 1980, AHM lists this steam engine with a $198.98. Along with the rest of the Rivarossi-made steam engines in the line, 1981 is the final year you'll find them in the AHM catalog. 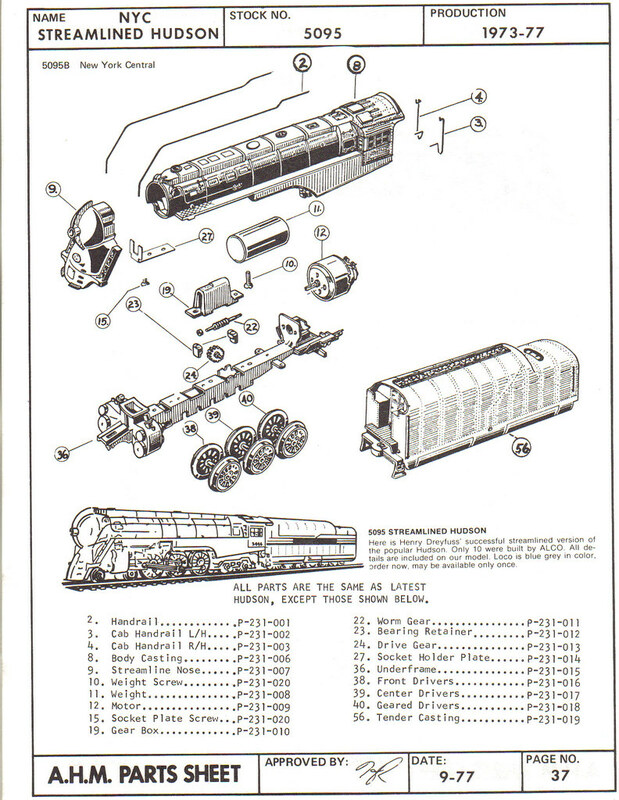 Above is AHM's parts diagram for the Streamlined Hudson. You may click on any thumbnail image to open a large version for best viewing.